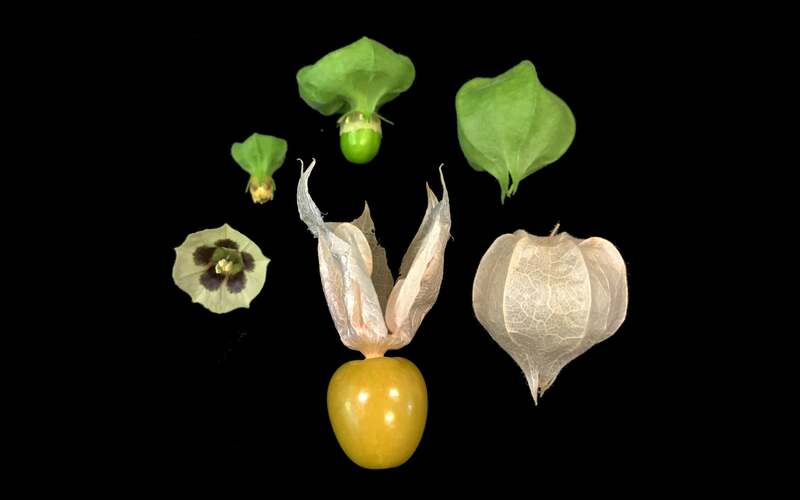 The life cycle of the groundcherry from flower (left) to fruit (right and center), as studied by Dr. Zachary Lippman and his team. The groundcherry is a tasty but bizarrely “wild” fruit, untouched by modern agriculture. Now, plant scientists from CSHL are using CRISPR gene editing to wrangle this unruly crop for large-scale production. Cold Spring Harbor, NY — Most people have never tasted a groundcherry; the small, sweet relative of the tomato that plant biologist Zachary Lippman describes as “tropically intoxicating.” That’s because the groundcherry plant, with its long, straggly branches and sporadically ripening fruit, is unsuitable for large-scale agriculture. For now, the treat is reserved for people willing to wrangle the plant in their garden or those lucky enough to find it at a farmers’ market. 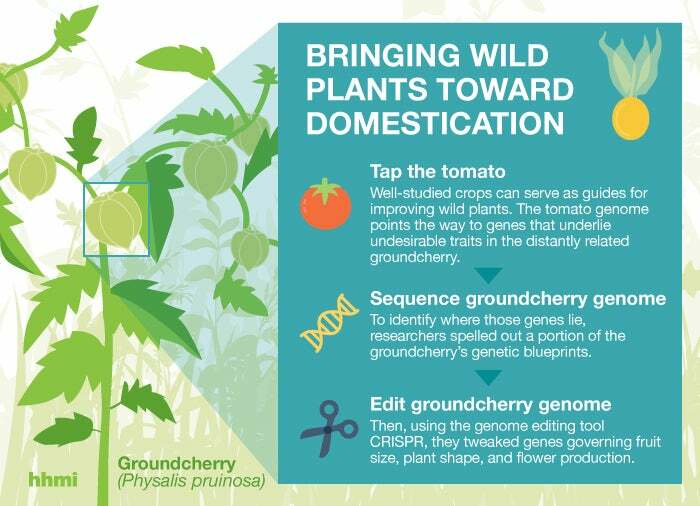 The steps taken to domesticate the wild groundcherry using CRISPR. Infographic credit: Howard Hughes Medical Institute. That could change, thanks to the genome-editing tool known as CRISPR. Howard Hughes Medical Institute Investigator and Cold Spring Harbor Laboratory (CSHL) Professor Lippman, heads a team with deep knowledge of tomato plants and the genes that control their growth. They used CRISPR to engineer groundcherries that maintain compact, manageable stems and that produce larger, more abundant fruit. Lippman says the fruit, which develops inside a papery husk like a tomatillo, has a surprising flavor, echoing both tomato and pineapple. The plant that produces it is still wild: no effort has been made to make it a practical crop through traditional breeding practices. Because the plant is closely related to the well-studied tomato, Lippman’s team had clues about which genes control the groundcherry’s growth and flowering. “We knew of some clear targets to improve the plant’s architecture, fruit production, and fruit size,” he says. In the October 1, 2018 issue of Nature Plants, Lippman, collaborator Joyce Van Eck at the Boyce Thompson Institute, and colleagues report the effects of CRISPR-mediated changes to three groundcherry genes. One change reins in production of a hormone that regulates flowering; making plants more compact and producing fruit in clusters rather than one by one. 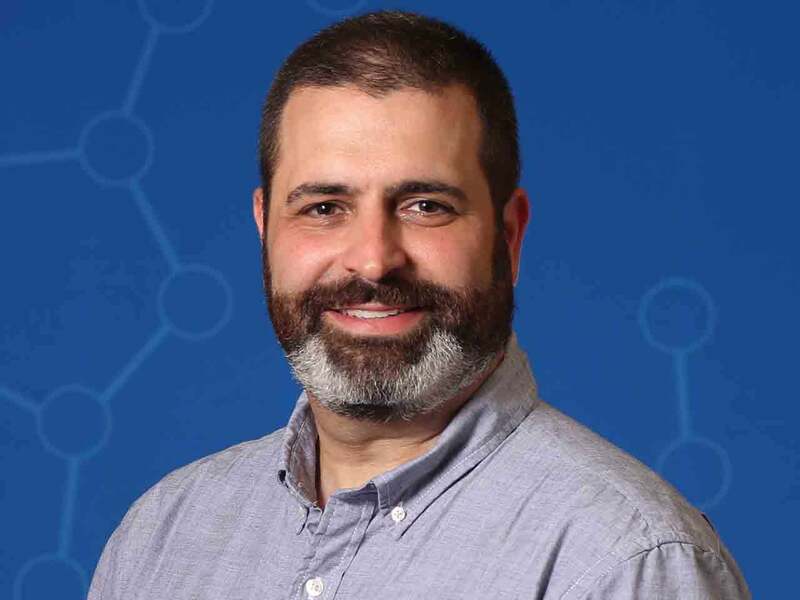 A change to another flowering hormone leads to denser fruit production: plants with a CRISPR-generated mutation in this gene produced up to 50 percent more fruit along a given stem length than the unmodified plant, Lippman says. The third change boosts the number of seedy sections within each fruit, thereby increasing its overall size. Lippman’s team is working on other aspects of the plant to make the groundcherry practical for large-scale production. The current success demonstrates that it’s possible. In less than two years, they achieved improvements that would have taken far longer using traditional breeding practices.